SILICON VILLAGE: Prime Video Ushers in the New Year with the Trailer Launch of Prime Original Series - Four More Shots Please! Prime Video Ushers in the New Year with the Trailer Launch of Prime Original Series - Four More Shots Please! 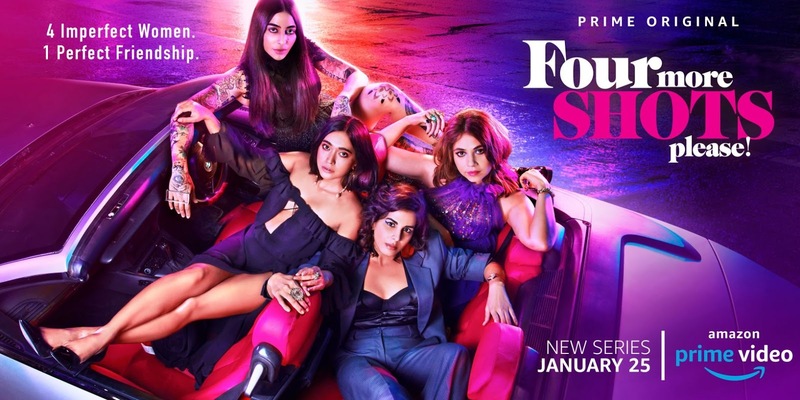 Amazon Prime Video, today, unveiled the much-awaited trailer of their upcoming Prime Original series titled Four More Shots Please! The series has been created by Rangita Pritish Nandy, produced by Pritish Nandy Communications and directed by Anu Menon. The new Prime Original casts a spotlight on the strong bond of female friendship that serves as a life-line for young women in urban India as they adapt, flourish and rebel in a rapidly evolving societal culture with changing gender roles. Helmed by a predominantly women cast and crew, the show has been written by Devika Bhagat, with dialogues from Ishita Moitra. Prime members from more than 200 countries and territories can binge-watch the 10-part series starting 25th January 2019. The bold and clutter-breaking trailer introduces us to the lead characters and captures their no-holds-barred banter and rapport, revealing their lovable imperfections and how they navigate modern life with its high and lows, contradictions and dichotomies. Audiences will get a glimpse of the dilemma faced by Anjana, a single mother in a tumultuous relationship with her ex-husband, struggling to move on both emotionally and sexually. We also meet Damini, a smart, successful, unrestrained and fiercely independent journalist who firmly believes that she needs no man to satisfy her needs; she owns her sexuality in a non-fussy, practical way. The trailer reveals the insecurities faced by Siddhi that stem from a complicated relationship with her mother, while showcasing Umang’s unbridled, sexually adventurous, bi-curious personality and enthusiastic willingness to experiment. Despite their obvious differences, these four girls share a beautiful friendship that forms the core foundation of their life and the support system that keeps them buoyant. The Prime Original Series stars Sayani Gupta, Kirti Kulhari, Bani J and Maanvi Gagroo along with a stellar ensemble cast comprising of Prateik Babbar, Lisa Ray, Milind Soman and Neil Bhooplalam along with Amrita Puri and Sapna Pabbi. Replete with pop cultural references, Four More Shots Please! is the one thing you need to watch to get into the mind of the modern Indian woman. The show launches on Prime Video on 25th January 2019.